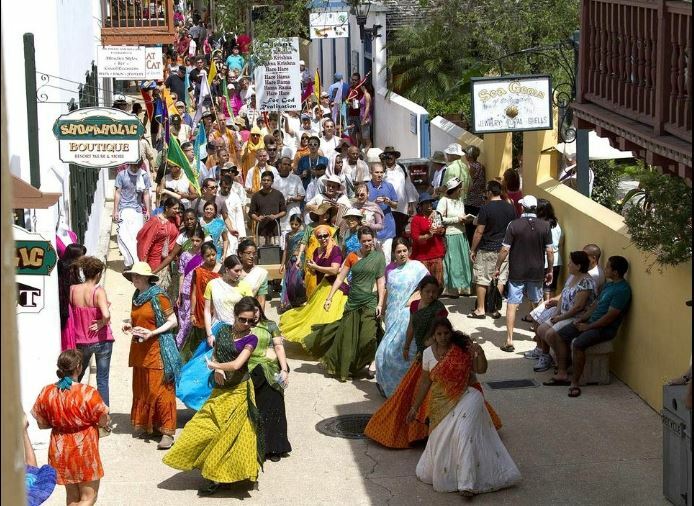 The bright, exotic atmosphere of India will come to St. Augustine this weekend at the Festival of Chariots. 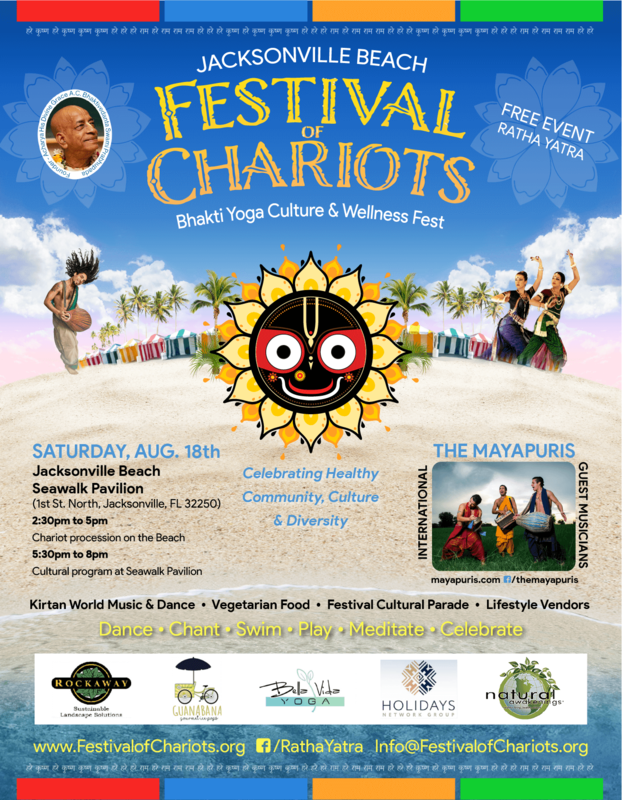 The 14th annual Festival of the Chariots and the Ratha Yatra Parade, an Indian multicultural extravaganza, will take place at the Plaza de la Constitución from 10:30 a.m. to 5 p.m. The highly visual event brings the colorful, traditional costumes and flower decorations of India. 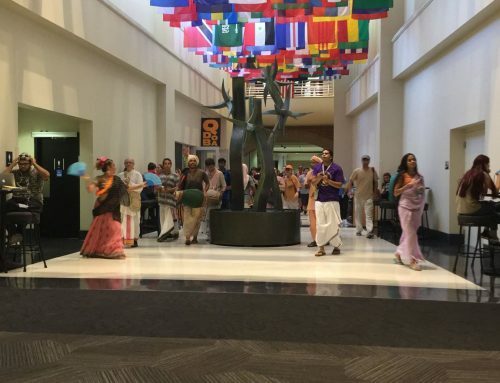 The parade and festival will be celebrated with family-friendly entertainment, including live music, the performance of a play, classical dance and books. However, the big draw is the delicious vegetarian food. There will be a scrumptious feast served free of charge to the public. The parade begins at 10:30 a.m. at the Plaza and returns to the same location. The procession route is about two miles long and can be easily walked by all age groups. The parade will move in a leisurely fashion, stopping here and there along the route, giving way to song and dance. The procession’s unique feature is a huge chariot with a blue, red and yellow canopy decorated with swans, lotus flowers, flags, Hanuman and a brass chakra on top. This chariot has two thick ropes attached to it that are more than 100 feet long. These ropes are pulled by the parade-goers, propelling the chariot along the parade route. Riding on the chariot are the beautiful deities of Jagannath, Baladeva and Subhadra, decorated with stunning silk outfits and real flowers. It’s a vision from another world. Accompanying the procession is lively Indian music and dancing, backed by double-headed mrdanga drums and karatala hand cymbals. 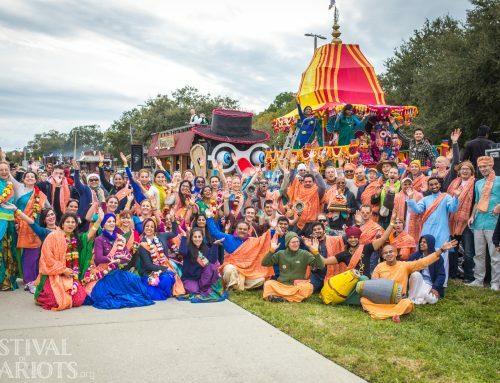 The festival is sponsored by ISKCON Alachua, the International Society for Krishna Consciousness. The founder/acharya, His Divine Grace AC Bhaktivedanta Swami Prabhupada, came to America from India 52 years ago and introduced the tradition of the Festival of the Chariot, called Ratha Yatra in India. Since the ’60s, this festival has been held annually in more than 50 major cities in the United States, Canada and all over the world. 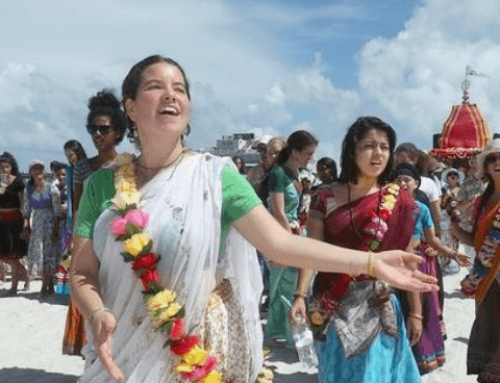 There are nine Ratha Yatras held in Florida each year, in Clearwater, Jacksonville Beach, Tallahassee, UCF Orlando, Tampa, Gainesville, Daytona Beach, Miami and St. Augustine. The parade begins at 10:30 a.m. at the Plaza and returns there by noon. At 1 p.m., there will be an hour long procession down St. George Street without the chariot. Then at 2 p.m., a cultural program begins. The free food will be served out all day from 11 a.m. until the festivities end at 5 p.m. The festival and parade will take place at the Plaza de la Constitucion at St. George Street and Cathedral Place. The Plaza is located at 170 St George St.
All are welcome to enjoy the events with free admission. For information, call Bhadra Das at 352 316-4560 or email Bhadradas@gmail.com. Or go to festivalofchariots.org.